Can I do transparent makeup even if I have too much oil in my face??? Even middle type skin and oily skin wants to be fancy!!!!! So I don't really use powder. However when I went to the salon to get my hair done, I heard that one of the employers was recommending me this product. When I looked over and tried it I want to rate with 4 stars. So I am writing a review on it. I use powder on special days and only on T zone. Because of my front hair I use it almost everyday. I used this powder for this whole week. There are variety of colors and textures; matt and sheer. I didn’t buy the matt texture but my friend gave it to me because she received it for free. This powder controls the oil better than other powders. It helps the makeup to last longer. It is matt but doesn’t give this pulling effect on the skin. This is really good for people who get glossy during lunchtime when they have their makeup put on in the morning. For the dry skin type, I recommend to use sheer type. Every time I use this I feel that I bought it for a good deal. The sheer have the entire positive point from the matt and makes your face even healthier. Also I really recommend for the people who only use for the T zone. When you want to give some highlight but you might feel it’s too much, than try this sheer powder to get smooth and shiny face. 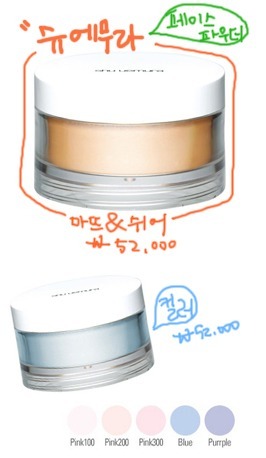 So if you want to use matt mix with the pink powder from Shu Uemura. When you are using well with the powder you have now don't really urge yourself to get this one. Try them out in the department store and buy them.